Many Springfieldians got their first exposure to electric lights from two traveling circuses in 1880. Within a year, however, the city’s first power station was powering 10 “very brilliant” lights downtown, and a group of prominent businessmen had created the Springfield Steam Supply and Electric Light Co. 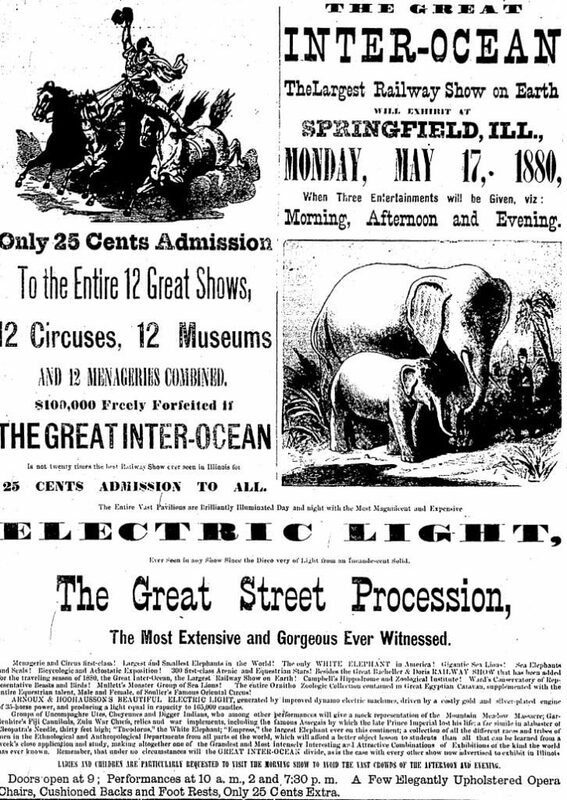 Both the Sells Brothers and Great Inter-Ocean circuses, which played Springfield within weeks of each other in April and May 1880, advertised electric lights as major attractions in addition to acrobats, exotic animals and daredevils. Arnoux & Hoohausson’s beautiful Electric Light, generated by improved dynamo electric machines, driven by a costly gold and silver-plated engine of 35-horse power, (produces) a light equal in capacity to 165,000 candles. Illinois State Journal columnist John R. Vaughn wrote in 1922 about seeing his first electric lights at one of the circuses. The dynamo was run with an upright traction engine, and the light produced was nothing short of wonderful. But you were disappointed when you found that the electric light wasn’t in operation in the crown lights with which the circus rings were illuminated. You saw there the half-circle torches swinging from the poles, and you knew the show was still burning the old-time lard oil. You couldn’t understand it, but the gentlemanly usher who passed your way with concert tickets explained. “Electric light is too bright. It blinds the performers. We tried it, but had to take it out after a dozen of our high-priced artists had been killed.” He was a gentlemanly usher, and you didn’t doubt he was a perfectly truthful one. More impressively the same month, an engine at Ide’s foundry near Fourth and Washington streets began powering 10 2,000-candlepower lights around downtown. (Each of the lights was the very rough equivalent of a 1,500-watt incandescent bulb today.) Three of the lights were outside, and the other seven illuminated the interiors of business establishments. Thousands of people came downtown the evening of July 21, 1881, to see the lights switched on for the first time. The Illinois State Register proclaimed the experiment a success. It is safe to conclude that the light will not be a favorite with all classes of people. Those who “choose darkness rather than light, because their deeds are evil,” will never take stock in it. Ide’s system, produced by a rival of Thomas Edison, was usable only for street and business lighting, the newspaper reported, not for home power. (T)he current passes from the machine at the foundry into a steam pipe, under ground, and is taken from a gas pipe at the Leland hotel. It then passes back over the wires erected for the purpose. Fears were expressd that … it might interfere with the workings of the telephone wires, but this it did not do. Springfield Steam Supply and Electric Co. (later Springfield Electric Light & Power) remained the city’s main power source until the city and private investors cooperated to create the Capital Electric Co. in 1894. Capital Electric was given the city street lighting contract in an arrangement that provided city government eventually would own the company’s power plant. Although it ended in controversy, the deal ultimately worked out for both sides. 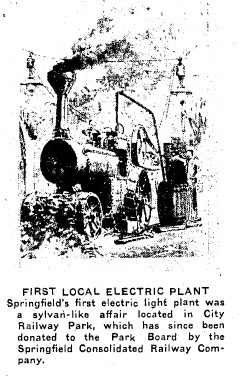 Although frozen out of the street light franchise, Springfield Electric Light & Power continued to provide power to most local homes and businesses during the period. A New York-based financial syndicate took over Springfield’s private electric, gas and street car operations in 1903, creating the Springfield Gas and Electric Co. Although Springfield took its first steps toward public power generation in the Capital Electric Co. deal, it would be nearly 30 years more before the city, led by Willis Spaulding, won the right to fully compete in the electric power market. *Most accounts – apparently based on an incorrect date in the 1918 Springfield Gas and Electric ad – say the Oak Ridge Park engine was installed in 1879. However, contemporary newspaper stories make it clear the display took place in 1881. The illumination began June 29 and continued through at least July. Note: This entry has been edited to correct misinformation about the earliest private electric companies. This entry was posted in Business, Industry, Prominent figures, Uncategorized. Bookmark the permalink.